The Community Church of Boston is a free community united for the study and practice of universal religion, seeking to apply ethical ideals to individual life and the democratic and cooperative principle to all forms of social and economic life. We invite you to read on to discover more about us, join us one Sunday for a thought-provoking and joyful time and learn more about our community. We can be reached at 617-266-6710 or at commchurch@gmail.com. We affirm individuals and communities in their free and responsible search for truth and meaning. We are composed of members who benefit from their practice and faith as Jews, Atheists, Humanist, Christians, Theists, Agnostics, Buddhists, Pagans, and so on. While we welcome discussion and reflection, we leave the answers about God’s existence and the after-life to each individual. We shape our ethics and morality based on lived experience, history, as well as our commitment to justice and love. 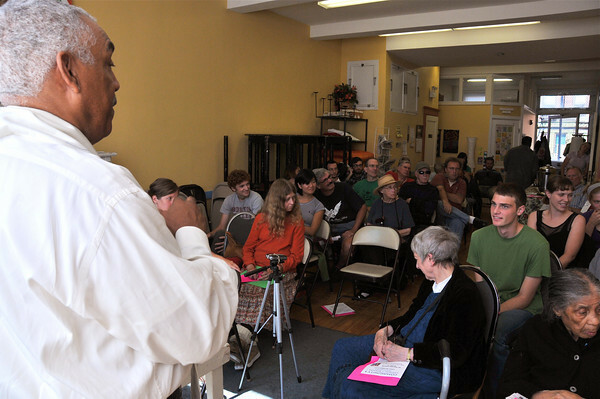 Since our founding in 1920 by Clarence Russell Skinner and John Haynes Holmes, the Community Church of Boston has been an active peace and justice congregation, a “free pulpit in action”, a non-sectarian, human-centered congregation with a rich and dynamic community life and a renowned history. For a detailed description of where we come from, we invite you to read A Brief History of the Community Church. From September through June, we hold services for individuals seeking to explore their involvement in a welcoming and family-friendly community fully rooted in justice work. • Our 11:00am Speakers Forum is when we hear from inspiring and thought-provoking speakers on social justice topics. We listen, reflect on what we hear, build community together and oftentimes take action. Music adds a wonderful dimension to the service, and we dialogue with our speaker before gathering at 12:45pm for lunch. Read more about Sundays. Our community is small, vibrant, and growing. With 60+ members and two Sunday services we also have hundreds of friends who come through our doors every year to participate on Sundays and in many other ways. In deciding to become a member of the Community Church of Boston, individuals agree with our Statement of Purpose stated at the top of this page and signify their membership by signing the Membership Book, which declares: “We the undersigned, accepting the stated purpose of the Church, do join ourselves together, that we may help one another, may multiply the power of each through mutual friendship and may thereby promote most effectively the cause of truth righteousness and love in the world.” On the first Sunday of each month we use time specifically during the service when individuals can, as they desire, come forward and sign our membership book – a brief but purposeful ritual symbolizing a commitment not only from the individual to the congregation, but also from the congregation to the individual. Each active church member becomes involved in our congregation’s life as ze/she/he is able: members attend Sunday services, contribute financially as they are able, and may also participate as Board members, Sunday co-facilitators, Justice School volunteers, members of committees, writers, painters, singers, actors, healers, and much more. Oftentimes, individuals who sign our Membership Book are members of other congregations, churches, synagogues, mosques, temples, etc. We welcome those who are part of other faith communities, as they help us discover and build bridges to new communities and enrich our own.